The purses have been purged. 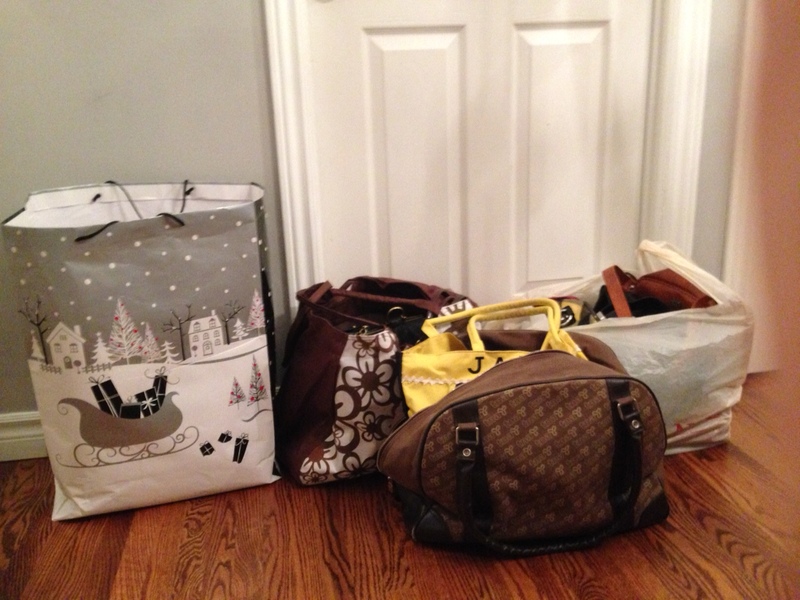 And I suppose the Christmas gift bag is apropos – it has been a gift to ourselves to free up more space. 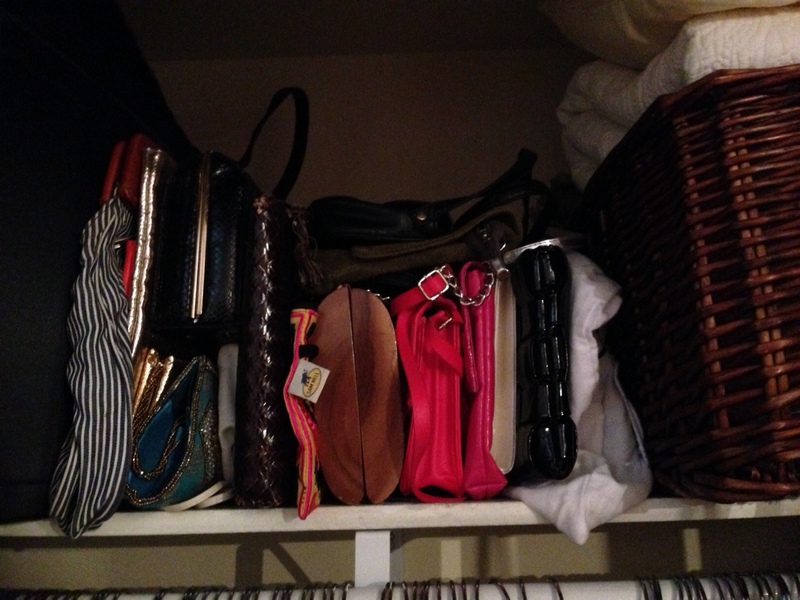 After purging (aka de-cluttering) our shoes, we moved on to purses and jewellery. We’ve made two hundred bucks. 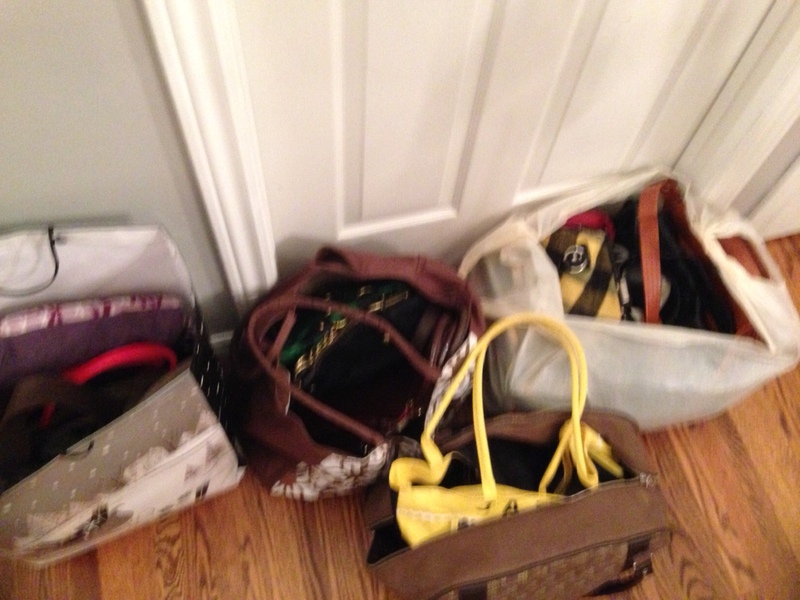 The photo, above, is of the bags full of bags that we unloaded from our life. So many of the items have been making us laugh. Why are we holding onto this stuff? It’s easier to poke fun at my wife. She’s Jamaican. We both know she’s Jamaican; why does she need 12 different logo emblazoned bags, t-shirts, sandals and picture frames that remind her – she’s Jamaican. And the colours don’t really go with our scheme. There is a certain fun to deciding, consciously, to get rid of things. It feels like taking control. Bye-bye, Jamaica totes – we’ll totes miss you. Anything that wasn’t purchased by the consignment shop is going to be put into the clothing swap I’m hosting, then everything not taken – goes to a charity donation drop-off center. I am feeling lighter. The shelf looks so tidy with the clutches nestled nicely against each other – visible and so much more likely to get used! I’m holding off on reading the next chapters of Marie Kondo’s book – anticipating that as I head into the basement I will need to bolster myself (for moral and spiritual support) as I attack the symbolic depths of my past – journals from my year abroad in Brazil, musical instruments I no longer play. Sports paraphernalia. Assorted strange and random, useful and useless items. I started my summer reading with something my close friends will find hilariously fitting: THE LIFE-CHANGING MAGIC OF TIDYING UP. 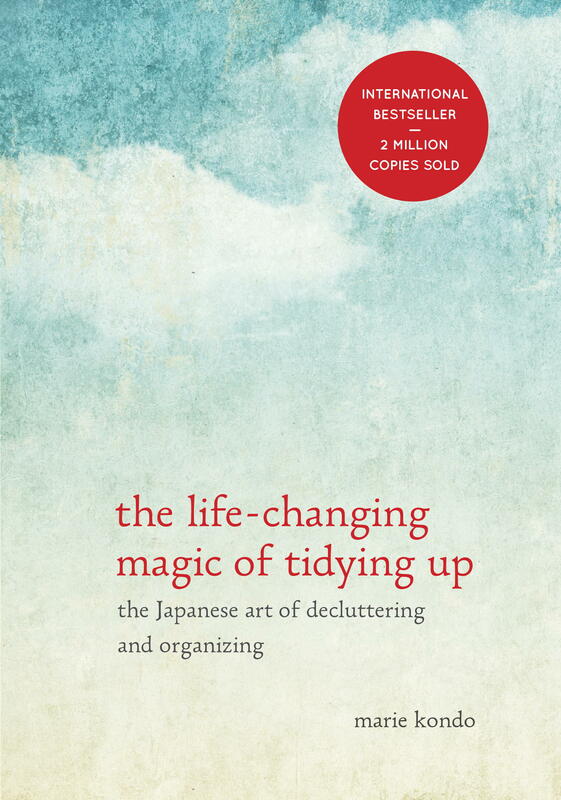 Described as a “guide to decluttering your home… Japanese cleaning consultant Marie Kondo takes readers step-by-step through her revolutionary KonMari Method for simplifying, organizing, and storing.” This is serious stuff. My friend, Bronwen, wrote a funny, but somewhat scathing review of this ‘methodology’ but my interest was piqued. My newest book indulgence inspired the month-long challenge. This kind of wacky, eccentricity seems right up my alley. Kondo asks, “Despite constant efforts to declutter your home, do papers still accumulate like snowdrifts and clothes pile up like a tangled mess of noodles?” Yes, Marie, yes. They do. And I am, admittedly an OCD (mildly) freak who has used a label maker to identify the drawers (by content) in her cupboard. I have a ‘hanger system’. I have come to understand that these routines/rituals/house rules, which others find weird (but which they often concur make complete sense) are what keep me sane at home, creating a safe-haven where I can FIND my things easily and know where they go; this is a necessary process after a long day at work, teaching people’s children, in an environment which is largely chaotic, messy, disorganized and dirty. I’m going all in for this one. 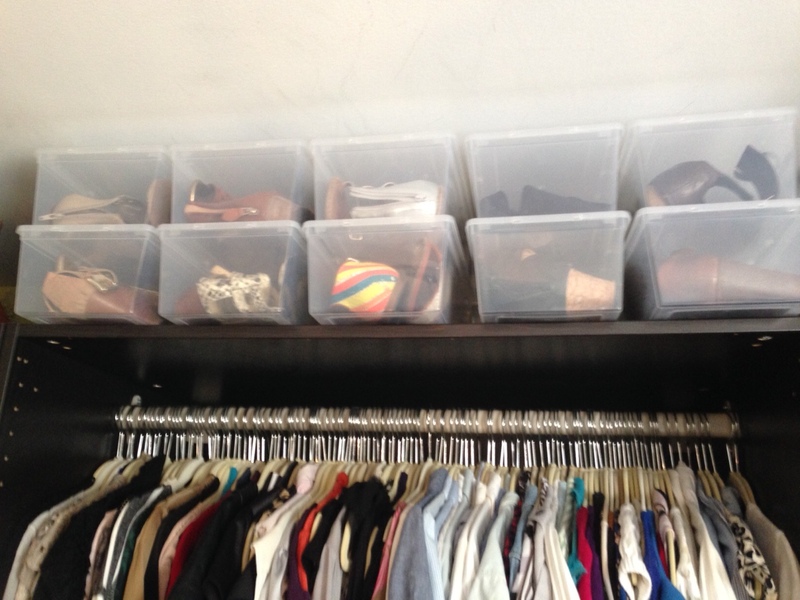 This is my month of KonMari Method. 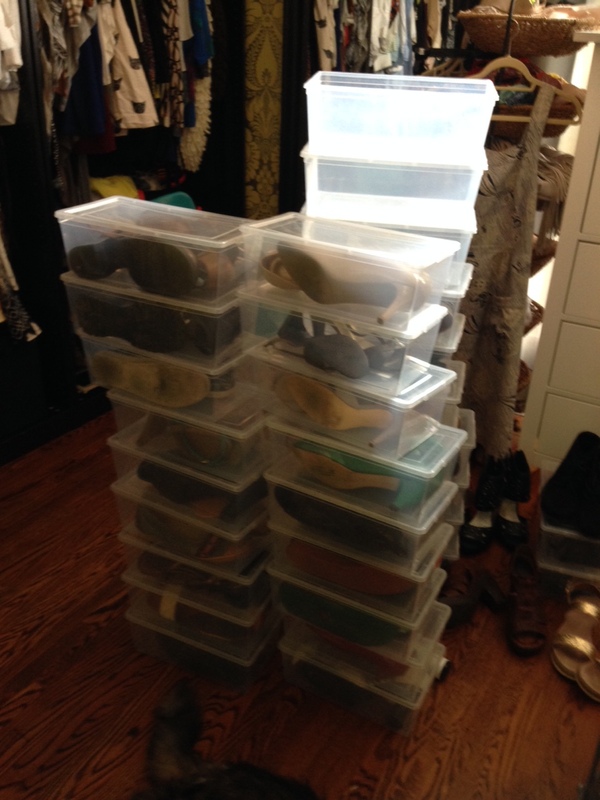 As she advised, I started with SHOES. Put ALL the shoes in a pile. All items of the same type. Get them from ANYWHERE they might be hiding and put them together so you can pick them up, one at a time, for the KonMari Test. I made/encouraged my wife to participate also. She and I moving in together, early in our relationship, was less a ‘thing’ than the amalgamation of our two closets. ‘You moved into the DRESSING ROOM?’ our friends would joke. This shared space requires a shared approach. Plus, she’s wonderfully ruthless. Two women equal a LOT of shoes. A LOT. Even our cat, Felix, found this process exhausting. 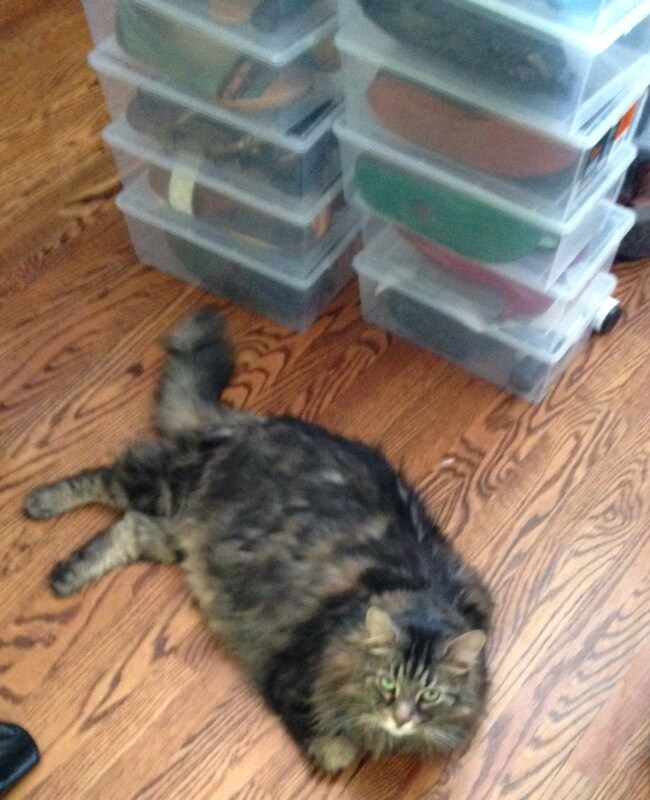 He later sought out a comfy spot, on top of shoe mountain, to observe our success. 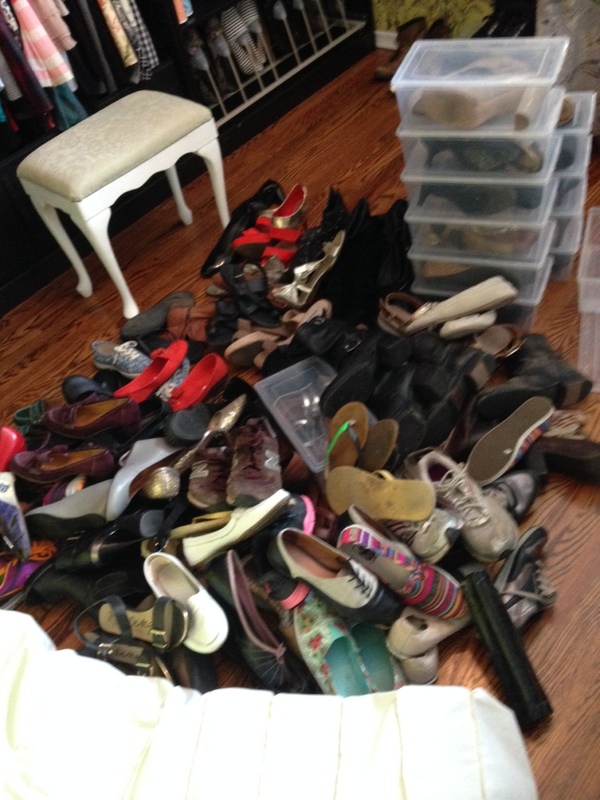 I am no Imelda Marcos, but I still managed to generate and get rid of an impressive pile. Marie, I feel lighter already. 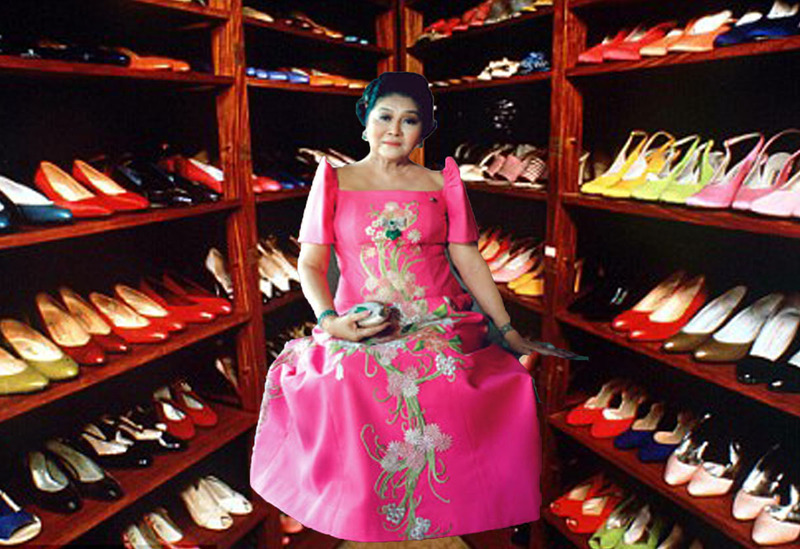 Imelda Marcos, amongst her shoe collection; impressive for the First Lady of a country that was bankrupt. Ferdinand Marcos was overthrown in February 1986. 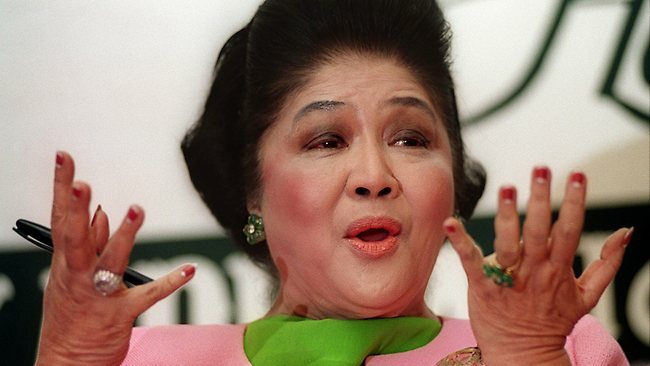 Philippine authorities took possession of what assets could be found, including Imelda’s trove of 2700 shoes. No developing country can excuse its leaders recklessly decking themselves out this way, while the people struggle to make ends meet. So, where do you put all these tidy, joy-sparking shoes? In clear plastic shoe boxes, obviously. Another thing that inspires joy…is that once you get rid of the things that are weighing you down, you can make room for things that you really love – and from selling the castoffs to a consignment store, as well as donating many pairs to Goodwill, we have some money to put towards a few pairs we REALLY love. We sold nine pairs for a profit of $58.00 and may list another online, plus we have three reusable bags FULL to drop off for charity. Keep your peepers peeled for the next assault on my personal possessions: The Accessories Department.